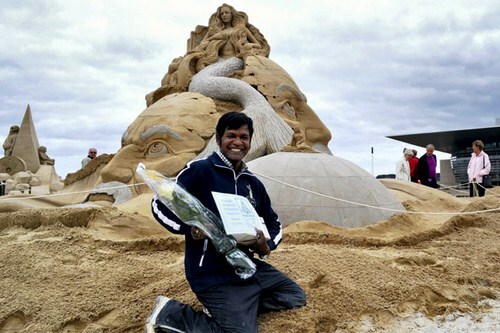 Odisha-based sand artist Sudarshan Pattnaik beat stiff competition from nine participants to win an international sand sculpture championship in Denmark, making India proud at the first such event in Copenhagen. Pattnaik's 2.5 metres high sand sculpture of a mermaid pleading for human effort to save the oceans was declared the winner of the championship. The Puri-based sand artist, known for his sculptures that send out strong topical and social messages, chose to draw a sand work to highlight the burning issue of climate change. "It was a free theme event where participants were free to chose the subject of their sculptures. I chose to draw an awareness sculpture and depicted the issue of climate change and the threat to our seas," a jubilant Pattnaik said. While Pattnaik walked away with the first price, artists from Ireland and Russia won the second and third prizes respectively. This was the first Copenhagen International sand sculpture championship, which was an eight day event. Artists were given seven days to create their sculptures on a Copenhagen beach. A total of nine countries were participating in the event. This is not the first time Pattnaik has made India proud at an international event. He has participated in more than 50 sand sculpture championships across the globe and has won many awards. 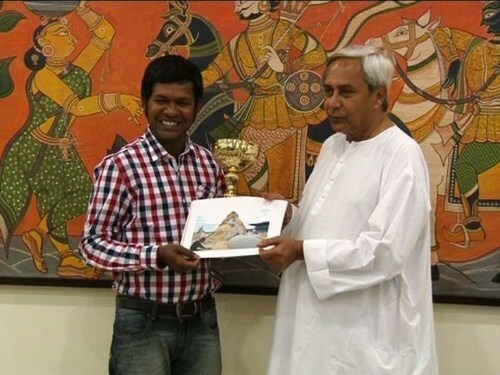 Recently Pattnaik was bestowed an honourary doctorate from Berhampur University in Odisha for his contribution in sand art.